If more baseball players knew in the 1940’s how lifting weights would enhance their careers, Cadillacs would have been in short supply. What is now a common practice in all of professional sports, was often discouraged during the Golden Era of baseball. Ralph Kiner, the Hall of Fame outfielder and legendary New York Mets broadcaster who passed away Thursday at the age of 91, was one of the early major league players to experience tangible results from weight training when it was unfashionable to do so. Kiner paced the National League with 23 home runs during his 1946 rookie season, yet returned to his home in Alhambra, Calif., unsatisfied by his performance as he also led the league with 109 strikeouts. He sought the advice of Clint Conatser, who lived nearby and served in the Navy at the same time as him. At the time, lifting heavy weights was frowned upon in baseball circles, as popular opinion was that the excess muscle would impede the flexibility necessary to swing a bat and throw a baseball. Kiner saw the positive effect that Conatser’s training had in reshaping his career, and despite it being discouraged by many in the game, he wanted in. In the winter of the 1946-47 off-season, he paid Conatser a visit at his home. Conatser’s uncertainty that Kiner would see the same results he experienced with his body-building routine didn’t phase the young slugger. Conatser told Brent Kelley in “The Pastime in Turbulence,” how Kiner viewed the physical training as an opportunity to truly place himself among the great power hitters of all-time. He immediately went out and purchased a weight set, built a gym in his garage, and spent the entire winter working out. The dividends were immediate. He hit 51 home runs in 1947 and cut his strikeout total to 81. No longer could pitchers get away with fooling Kiner, as he made them pay repeatedly for the same pitches he was vulnerable to the season prior. Eddie Basinski came to the Pittsburgh Pirates in a trade with the Brooklyn Dodgers during the same off-season that Kiner dedicated himself to building his physique. 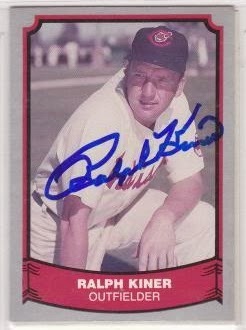 Basinski, speaking in a 2009 interview with the author from his Portland home, recalled the prodigious nature of Kiner’s newfound strength.